Der litauische Komponist und Maler Ciurlionis (1875-1911) wurde erst nach seinem Tod in seiner Bedeutung erkannt. Vor allem sein umfangreiches Pianowerk zeigt die verschiedenen Phasen (inspiriert von Chopin, J.S. Bach u.a. ), lässt bereits Ansätze zur atonalen, seriellen Technik erkennen, entspricht im Reichtum der Farben und der feinen Nuancierung den Gemälden (zahlreiche Abbildungen im informativen Begleitheft.). Ciurlionis war der Christopher Columbus eines neuen, geistigen Kontinents (Romain Rolland). Der 1960 in Bremen geborene Pianist Lahusen, bekannt aus Funk und Fernsehen, spielt in dieser ersten Folge Fugen, Präludien u.a. - insgesamt 29 Klavierstücke, komponiert zwischen 1899 und 1909. Mikalojus Konstantinas Ciurlionis—painter, composer, thinker and visionary—was born in 1875, in the southern Lithuanian town of Varena, near Vilnius. Beginning his artistic career as a composer, in his final years he additionally devoted himself to the art of painting. Doubly talented and a visionary artistic figure of the years linking the late Romantic with the Modern Age, he was one of numerous creative innovators, among them Skryabin, Schönberg and Ravel, all born in the same year. He was granted only ten years to exercise his extensive creative talents before his untimely death in 1911. Between 1899 and 1909 he produced 250 musical compositions, 150 of which were scored for solo piano, as well as 200 paintings and 80 drawings. Deep depression and exhaustion hindered him from being artistically productive thereafter. It is the piano compositions, in particular, which have secured him posthumous fame. Following the early lyrically romantic piano pieces, he turned towards a modern style replete with constructivistic detail. In his way he anticipated the melodic form of serial music, using ostinato tone progressions embedded in flickering chromatic atonal surfaces. After about 1908 his music became atonal, strictly contrapuntal and linear, less sensuous than that of Skryabin's. Later generations have seen the paintercomposer Ciurlionis as an aesthetic revolutionary. Some art historians argue that his works, with their mystical approach to the natural world, are examples of abstract—or at least non-figural—paintings predating Kandinsky's own steps in that direction. A number of musicologists claim, on the other hand, that Ciurlionis used tone rows as a basis for musical composition even before Schönberg. The French novelist Romain Rolland has perhaps found the most fitting words for the greatness and universality of this unique artist: "It is hard to describe how strongly I am moved by this remarkable art, which has not only enriched the world of painting but also widened our horizons in the area of polyphony and musical rhythm. Ciurlionis was the Christopher Columbus of a new intellectual continent." 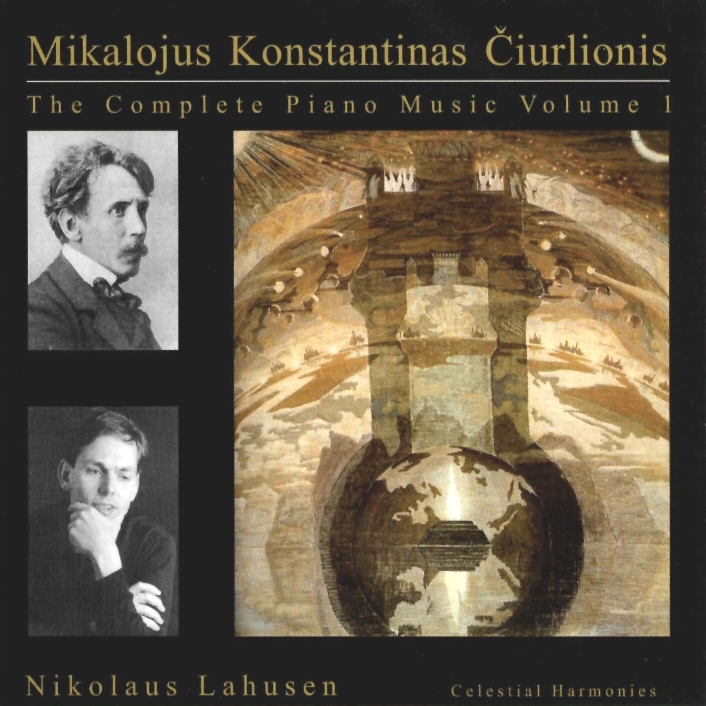 Recorded in June and December 1999, at Bavaria Studios, München, as a coproduction between Celestial Harmonies and Bayerischer Rundfunk, this is the first volume of the complete piano music of Ciurlionis, performed by Nikolaus Lahusen. Lahusen was born in Bremen in 1960 and grew up in Mexico. His artistic development was supported by Edith Picht-Axenfeld, Christoph Eschenbach and Bruno Leonardo Gelber. Counted among the leading pianists of his generation, Lahusen has given concerts worldwide and has appeared in important concert halls (Philaharmonie in Munich, Musikhalle in Hamburg, Beethovenhalle in Bonn, etc.) and with leading orchestras (European Community Chamber Orchestra, Sapporo Symphony Orchestra, Sinfonia Nacional de Argentina, etc.). Important radio and television stations inside and outside of Germany broadcast his concerts and recordings; his numerous recordings have been well received among music critics. Lahusen's performance at the Orff-Nacht, organized in honor of Orff's 100th birthday in Munich in the summer of 1995, was referred to by the press as outstanding, which led to the release of Orff-Schulwerk, Volume Three: Piano Music (13106). 1 Fuge c-moll (op.10,1), 1902 VL 219 2'35"
2 Präludium b-moll (op.3,1), 1899 VL 169 2'39"
3 Humoreske g-moll (op.3,2), 1899 VL 162 2'46"
4 Präludium f-moll (op.3,4), 1899 VL 164 1'34"
5 Mazurka h-moll (op.3,3), 1902 VL 234 1'34"
6 Fuge fis-moll (op.10,2), 1902 VL 233 4'00"
7 Nocturne fis-moll (op.4,1), 1900 VL 178 3'30"
8 Impromptus fis-moll (op.4,2), 1900 VL 181 5'57"
9 Präludium Fis-dur (op.6,1), 1901 VL 184 2'22"
10 Nocturne cis-moll (op.6,2), 1901 VL 183 3'05"
11 Fuge h-moll (op.10,3), 1902 VL 224 4'35"
12 Präludium h-moll (op.16,1), 1904 VL 254 0'45"
13 Präludium h-moll (op.16,2), 1904 VL 259 0'39"
14 Präludium d-moll (op.16,3), 1904 VL 256 3'10"
15 "Eintracht" (op.16,4), 1904 VL 255 0'50"
3 Präludien b-moll über ein Thema 5'55"
16 VL 271 (op.20,1), 1905 VL 271 1'23"
17 VL 270 (op.20,2), 1905 VL 270 2'28"
18 VL 269 (op.20,3), 1905 VL 269 2'01"
19 "Besacas"-Variationen (op.18), 1904-1905 VL 265 8'15"
20 Fuge e-moll (op.10,5), 1902 VL 226 2'46"
21 Präludium d-moll (op.21,1), 1906 VL 294 0'57"
22 Präludium d-moll (op.21,2), 1906 VL 295 2'09"
23 Präludium d-moll (op.21,3), 1906 VL 296 0'37"
24 Präludium d-moll (op. 21,4), 1906 VL 297 0'47"
25 Choral-Fuge a-moll (op.10,4), 1902 VL 227 3'55"
26 Präludium d-moll (op.31,1), 1908 VL 325 1'45"
27 Präludium d-moll (op.31,4), 1908 VL 322 1'14"
28 Präludium C-dur (op.31,2), 1909 VL 327 1'02"
29 Präludium C-dur (op.31,3), 1909 VL 328 1'21"